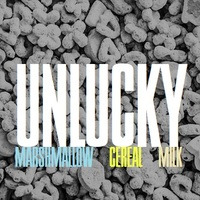 Unlucky; Marshmallow front, Sweetened Oat Cereal, Milk exhale. So this was primarily supposed to be a marshmallow cereal but it's not that. However there is something unique that some have enjoyed. Personally I get a creamy greasy dough flavor which is oddly enjoyable. I did a bunch of new versions that ended up being a bit further than what I was going for so I've decided to leave this as it's original and post a new one as it's completed.